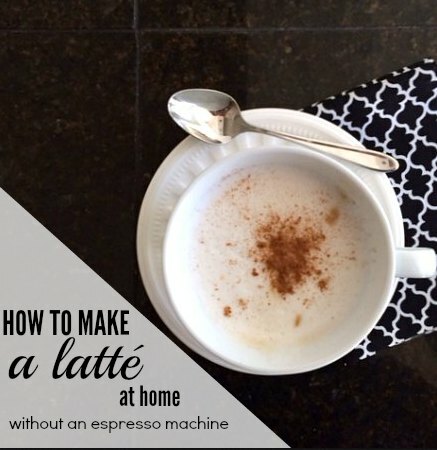 How to make a latté at home without an espresso machine. As of today, there are 987 posts in the MMD archives. According to my highly unscientific calculations, this is the #1 post that I hear “it changed my life!” about. I completely understand, because it happened to me. Years ago—maybe five or six—I gave Will an Aeropress for Christmas: a new-to-market espresso machine that only cost $25 and Cooks Illustrated heartily endorsed. I was skeptical, but it was $25. I gave it a shot. From the first lattés we made on Christmas morning, we were hooked. It changed the way we made coffee, and we make coffee every single day. I didn’t do many lattés for a couple of years (Whole 30 and aftermath), and I still do a simple pour over for my first cup of the day. But lately I’ve gotten back in the habit of homemade afternoon lattés. When I posted this on instagram recently, you all asked what kind of espresso machine I used. I’m still using our original Aeropress, and it’s still going strong after thousands of uses. That just might be the best twenty five bucks I’ve ever spent. I wanted to sing Aeropress’s praises once again, especially since Christmas is coming. It’s such a terrific and affordable gift. But we’ve also changed a few things about how we make coffee in the last few years, and I wanted to update you on everything I’ve learned since that post was published over three years ago. First, we’ve become scale people in the kitchen, and now measure our coffee by weight, not volume. (This is the scale we use.) I’ve provided both measurements here. One morning I accidentally frothed my milk before I heated it up, and was surprised at how much better the milk frothed. I now froth my cold milk while I grind my coffee, and then heat it in the microwave while I make the espresso. And finally, we now keep a high-powered blender on the counter. Many of you have asked if the blender does a satisfactory job of frothing the milk. The answer is a resounding YES: a high-powered blender does an excellent job. This recipe makes a 12 ounce latté. 2. Put 2 scoops (30 grams) of coffee into the chamber. 3. Froth the milk. I use an aerolatte to froth the milk right in my mug. You can froth the milk in your blender (30 seconds or so on high) and pour gently into the mug, using a spoon to hold back the foam. Then carefully spoon the foam onto the top of the milk’s surface. There are 2 manual ways to froth the milk: hold a small whisk tightly between your palms and twirl it back and forth for 30 seconds, OR pour the milk into a jar with a tight seal and shake vigorously for 30 to 60 seconds. 6. Pour hot water over coffee and stir for ten seconds. 8. 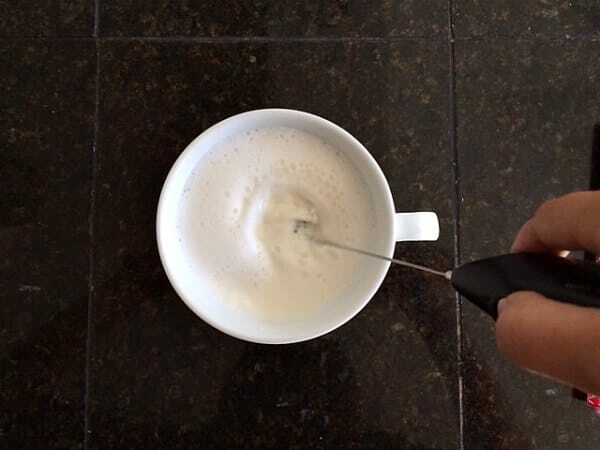 Gently pour your espresso into your hot frothed milk. • you aren’t going to get any beautiful latté art with this homemade version, fabulous as it may taste. 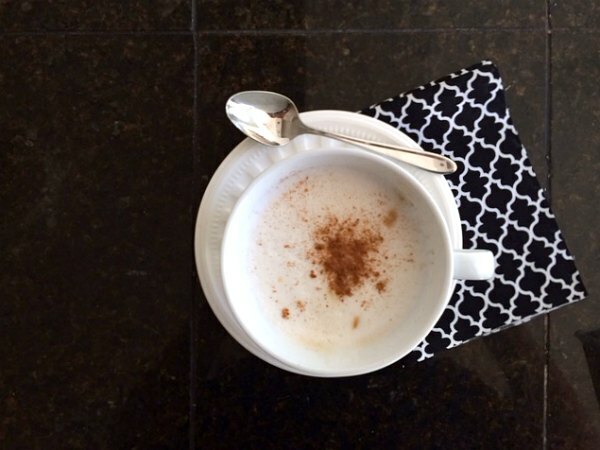 A sprinkle of cinnamon will make your coffee look prettier. • wash off your Aeropress filter and reuse it. I use mine twice, then discard. To make an americano: Brew espresso as directed above. Add 8 ounces hot water (or as desired). 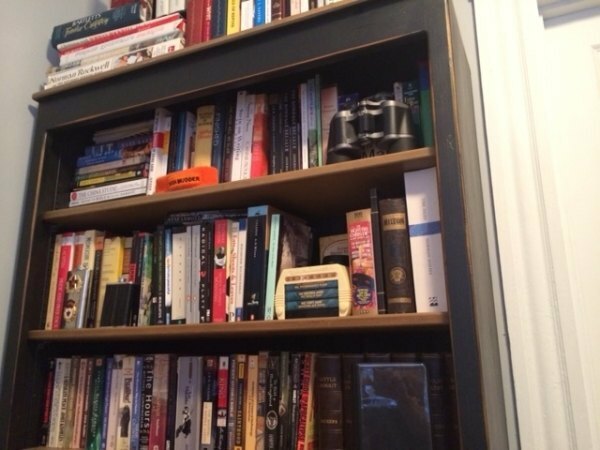 I’d love to hear your favorite home coffee tips and tricks in comments. And if you have any experience with the Aeropress, please tell us all about it. Previous: What would Victoria Beckham do? A friend gave me her Nespresso machine (very basic) when she left Zurich to return to the States. It changed my life. Before that I used a Bialleti (pretty sure I’m spelling that incorrectly). It’s been that long since I’ve gazed upon it. I make lattes on weekends, warming the milk on the stove, then frothing with my Bodum frother. We are old school – no microwave in our Munich flat. I’m sure your gizmo is great – but don’t underestimate the fabulous espresso that is produced by a Nespresso machine. Even the no-frills machines run for years and make quick work of a morning fix. We got a Nespresso over the summer and it’s the best thing ever!!! It is so fast and tastes so great. We use both the regular pods and the refillable ones so we can use our own organic/fair trade/etc. coffee when we want. I don’t drink coffee any more (mostly thanks to your “discover your caffeine personality” post. Once I started paying attention, I realized how awful it made me feel). But I used to love my aeropress, and now I’ve gotten my husband hooked. He works on a ship for a couple months at a time, and I gave him both an aeropress and an electric kettle for the ship and he says it has greatly improved his quality of life on board! So glad to hear he could take it aboard! I can imagine how daily good coffee would make a huge difference in quality of life. I got one of these (thanks to you) for Christmas last year. I love my lattes and don’t have the money or the counter space for a big machine. I couldn’t be happier with the Aeropress. My mid-morning latte has become a much loved ritual. I have found that I like my milk hotter than they/you recommend–about 2 min in the microwave. I will try foaming before heating it today. Thanks for the tip. One question though – what kind of grinder do you use for the beans? I have one that dates from way back in college and might upgrade that in this morning coffee gift set. I use this Cuisinart burr grinder. Just like the reviews say, it is loud. (We keep a dish towel wrapped around ours to muffle the sound a bit.) But it’s lasted a long time and produces a nice grind. The Aeropress and Aerolatte were Christmas presents to myself last year based on your post. Thank you SO much. 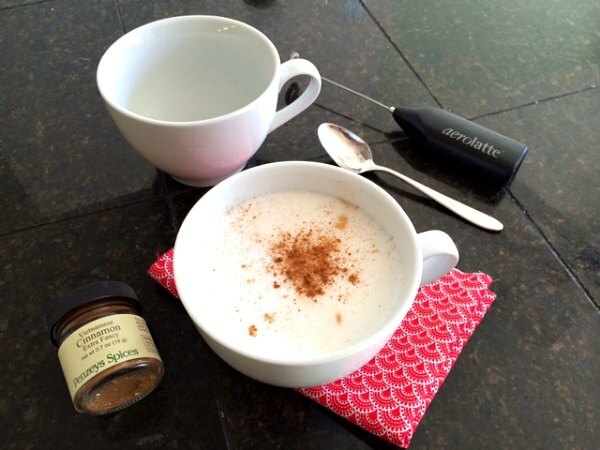 I absolutely love making my own lattes and would definitely recommend these products. Anne, because of your post, I asked for (and received) the AeroPress and frother last year for Mother’s Day…best gift I’ve gotten since Santa brought me a much-coveted Barbie camper in 1971! Even though we haven’t actually met, I think of you every morning when I’m making myself a fabulous latte! I’m so glad! Raising my coffee cup to you—cheers! I’ve never made Turkish coffee, but I’d love to try it! 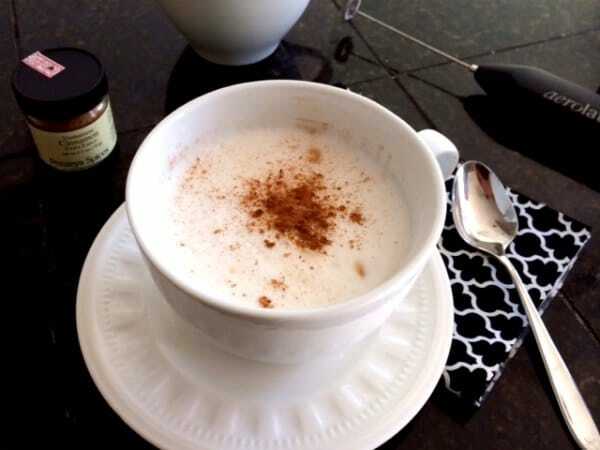 This is not for coffee purists out there, but I like adding cinnamon to my grounds and then pouring on my hot water. There is a lovely warmth to the brew, and it is not bitter at all (which is what I find happens when I add cinnamon afterwards). Where can u get small cups/mugs for making the espresso? I just use a small teacup for mine. It’s part of a normal place setting. If I didn’t have a small teacup, I could use my regular coffee mug with no problem. I just noticed that my Starbucks has tiny, 3 oz. espresso mugs. $7, I think. I think they’re just for the holidays, but it might be a place for you to look. Thanks for these tips! We love our Aeropress…some friends gave it to us as a going away present when THEY moved away (which is backwards, but we adore them for it). There’s no bitter aftertaste with it. (I’m drinking decaf pressed from it right now.) I have no tips, but wanted to help you sing its praises. 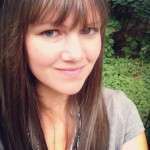 This might becomes your second most popular post! Who knew a latte could be this easy? 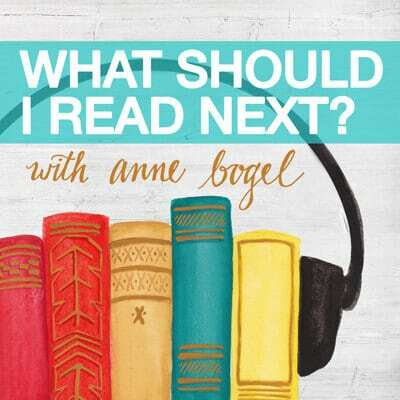 Well, I guess your long time readers, maybe…but I didn’t! I want a latte so much right now :). Can’t wait to try this. Thanks! I bought my aeropress about three years ago when my second child was a baby and I finally gave into realizing I was drinking coffee way too often to be buying it from coffee shops. I have started making mine using the aeropress inverted – have you tried that? It really improves the crema and taste I think. How would one use the Aeropress inverted? It seems like the water/coffee would run out. 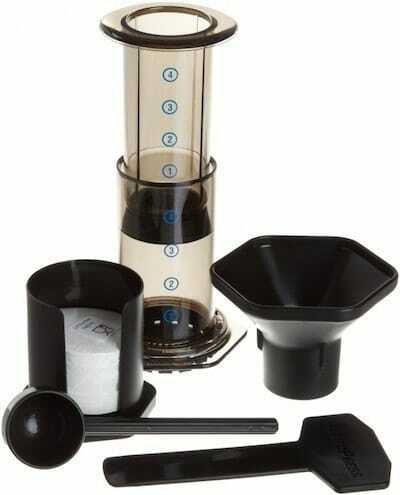 I have never heard of the Aeropress until I read this post earlier this week and now I want it. Then, I see it on last night’s episode of Covert Affairs! It’s a sign, I tell you! I’ve got a birthday coming up, and now I know what to ask for! I love espresso, but I just can’t stomach the cost of fancy coffee shops these days. This looks like a major budget saver! Yeah you could. 🙂 You’ll feel so spoiled! In a good way, of course. Because of your post I received an Aeropress for Christmas! Just made my first latte–yummy! Wondering how much milk you froth and heat for your lattes, though. Is it 8oz of milk + 4oz of espresso? Also, do you ever use flavors and when would you add them? I usually use 6 ounces milk, but I like mine strong. 🙂 8 oz milk is standard for a 12 ounce latté (a Starbucks grandé), plus two shots of espresso (1.5 ounces per shot, so 3 ounces). For a latté add the flavor into the milk before frothing. Yes, such blender is very useful at kitchen. Not only for lattte.